The Great Recession destroyed the job market for workers without college degrees, and the situation hasn’t gotten any better. This begs the question—can you still enjoy a high standard of living without a college degree? 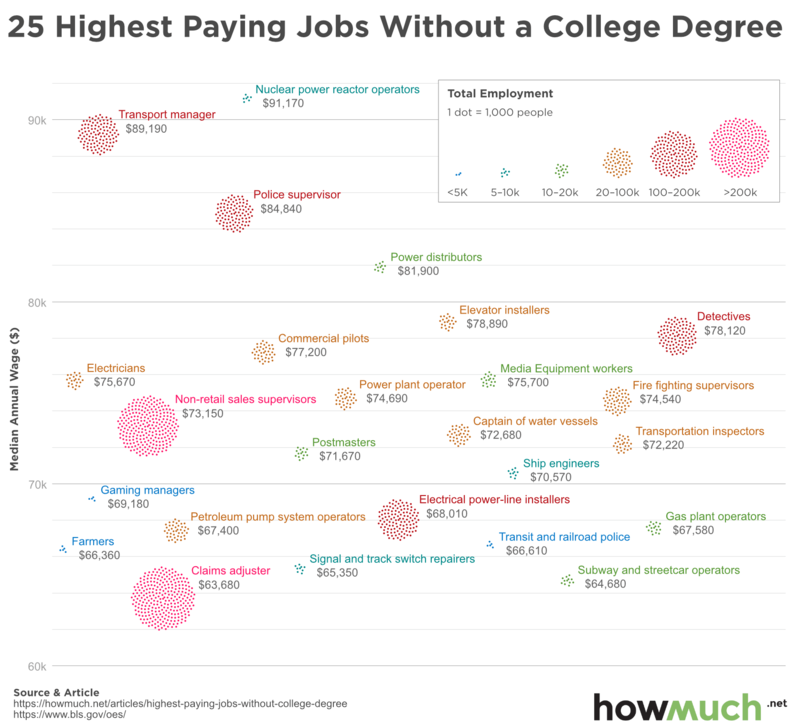 And what are the highest paying jobs for people without a traditional higher education? Our new chart sheds some light on these pressing questions. The Bureau of Labor Statistics tracks which professions do not require a college education, how many people currently hold those jobs, and their median salaries. We combined this information into a scatter plot graph. The more dots you see, the more people work in that profession. And the higher the dots on the vertical axis, the more money they make. You can quickly see some pretty interesting trends. There are a lot of people without college degrees who make a great living. The median household income in the U.S. is $56,516. By that standard, all the jobs on our chart pay well above average. Specialization is the key to earning a high wage, especially in an area that cannot be outsourced. Elevator installers, power plant operators, transportation inspectors—these are all professions that require a high level of skill and must be done in person by someone with years of experience and certifications. Regardless of how automation affects the economy, you won’t ever be able to replace jobs like firefighting and law enforcement, despite what futuristic movies like Minority Report may have you believe. And now, a word of caution. The top 25 professions where you don’t need a college degree only employ about 1.4 million people. That’s a lot of people, but the entire working population in the U.S. is over 205 million people. In other words, these jobs not only demand years of experience and specialization, but they’re also pretty rare. And don’t be mistaken: you may not need a college degree, but you do need some type of post-secondary training. You can’t just graduate high school and start your own electrical company. You have to work as an apprentice or join a training program first. That being said, it’s still possible for people without a formal college education to earn a respectable salary. The big takeaway from our chart is that you want to be in a position that can’t easily be replaced through automation or outsourcing. If you can find a career like that, then you’re in good shape to enjoy a high standard of living.